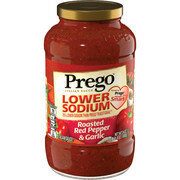 Product - (2 Pack) PregoÂ Lower SodiumÂ Roasted Red Pepper & Garlic Italian Sauce, 24 oz. 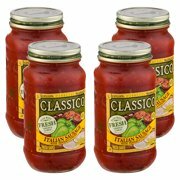 (2 Pack) PregoÂ Lower SodiumÂ Roasted Red Pepper & Garlic Italian Sauce, 24 oz. Product - Rao's Specialty Food Homemade Sauce - Peppers And Mushroom - Pack of 12 - 24 Oz. Rao's Specialty Food Homemade Sauce - Peppers And Mushroom - Pack of 12 - 24 Oz. 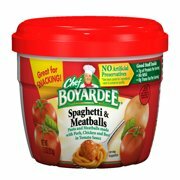 Product - (8 Pack) Chef Boyardee Spaghetti & Meatballs in Tomato Sauce, 7.5 Oz. (8 Pack) Chef Boyardee Spaghetti & Meatballs in Tomato Sauce, 7.5 Oz.